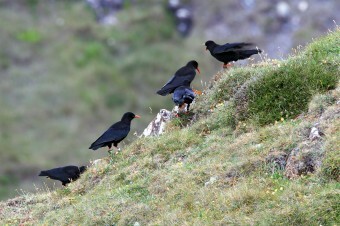 After an absence of nearly 30 years, choughs returned naturally to Cornwall in 2001 when 3 pioneering birds from Ireland settled on the Lizard peninsula. 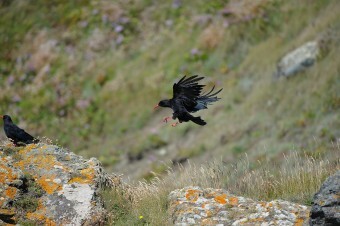 Choughs have successfully bred every year since their return, establishing a small population which is gradually re-colonising the Cornish coast. There are now almost 40 Cornish choughs frequenting the cliffs from Padstow in north, in the west around the Penwith and Lizard peninsulas, and the Roseland on the south coast. Members of the crow family, choughs are identifiable by their bright red legs and bill, their rasping ‘cheeow’ call and their daring acrobatics whilst in flight. Choughs in the UK are coastal birds, whose favoured habitat is short maritime grassland and heathland, grazed coastal slopes and cliff–top pastures which provide insect-rich areas for foraging, and high cliffs and sea caves which offer safe sites for nesting. Loss of suitable habitat played a central role in the chough’s demise in the region; as traditional farming methods shifted, stock no longer grazed the cliffs year-round, and the favoured short-sward pastures became rank and unusable for the birds. Now that choughs have returned to Cornwall, establishing sufficient habitat to support the growing population is a priority. Choughs are ground feeders which specialise in digging out invertebrates from exposed soil and short open swards using their strong curved bills – Palores their Cornish name translates as digger! 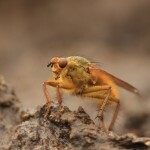 Crane fly larvae are their most favoured prey, with beetles, ants and their larvae also very important. Ideal habitat features a mosaic of vegetation that includes large areas of weather maintained cliff slope with plenty of bare earth exposures, and grazed slopes and pastures where sward heights are shorter with an open structure, so that the birds can access the earth to forage. 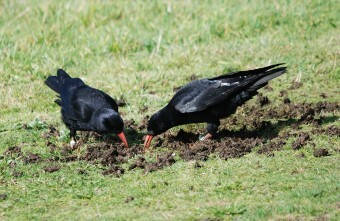 Choughs have a close association with grazing animals, whose dung provides a rich source of invertebrates – a particularly important food source for young birds. The year-round grazing of coastal slopes and heathland by cattle, ponies and sheep helps keeps invasive scrub at bay and maintains the open mosaic grassland which is so important for these captivating crows. In the breeding season good foraging habitat should be in close proximity to nest sites to increase breeding success – ideally within 300 metres. In the autumn and winter months choughs also target seeds, so leaving spring-sown stubbles over winter provides an important supplementary food source. 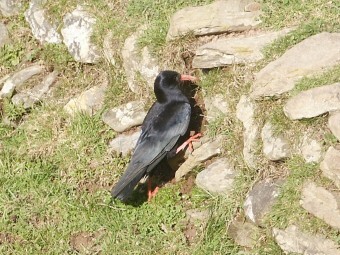 Additional features which are important for choughs include traditional stone and earth banks, and well-walked footpath areas, where the very short turf and bare earth can be probed for invertebrates. Land management practices which are detrimental to choughs include abandonment leading to bracken, bramble and scrub, low grazing pressure, winter sown cereals, habitat monoculture and intensive use of avermectin de-worming drugs. Much of the work undertaken to improve habitat for choughs has been through targeted use of agri-environment schemes to reduce these practices and encourage a mosaic of vegetation. Many farmers and land managers around Cornwall’s coast have been very supportive and embraced management for choughs, often their hard work and dedication turning long abandoned areas back to beautiful species-rich grasslands. 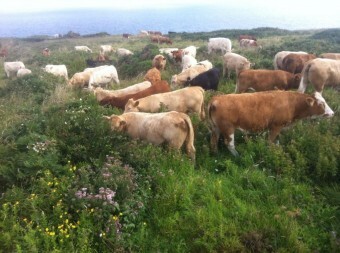 Such conservation management has also benefited other priority species which have suffered due to decline of grazing on the Cornish coastal fringe. Cornwall’s species-rich maritime grassland is home to numerous declining species, including 19 UK BAP priority species. These include perennial centaury Centaurium scilloides, yellow centaury Cicendia filiformis, chamomile Chamaemelum nobile and wild asparagus Asparagus prostratus. Coastal heathland areas also host many rare and threatened invertebrates, the silver-studded blue Plebejus argus, and the hornet robberfly Asilus crabroniformis, as well as BAP vertebrate species such as the greater horseshoe bat Rhinolophus ferrumequinum, the corn bunting Emberiza calandra, the cirl bunting Emberiza cirlus and the slow-worm Anguis fragilis. Like choughs, these species rely on a mosaic of heathland and grassland, scrub and hedgerows, alongside associated farming habitats. Re-instatement of grazing, scrub removal and over-wintering of stubble in critical areas is essential to their conservation. Most importantly, a good variety of practices on any one site can maximise conservation benefit to numerous species. 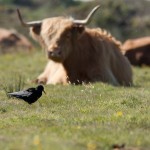 The long-term success of choughs in Cornwall relies on an integrated approach, which works with land managers to continue to maintain favourable habitat, whilst recognising the challenges and realities of modern farming systems.